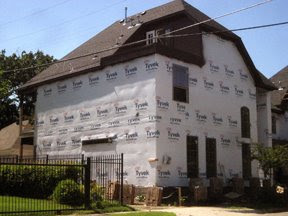 In Dallas as it is all across the country the small homes of yesteryear are being replaced by modern upscale houses; McMansions, Starter Castles, Coliseums of Consumption. But this has to be a new plateau for the construction of zero lot homes. Apparently the architect did not think about phone lines overhead until they started building of the roof. That's when it must have dawned on them that the cables were going through the roof line. So they just tied the cables up with plastic ties and added a third floor balcony. Problem solved. Wow - ugly. But why don't you post a picture of the house next door to yours? It's a true monstrosity too.